These are protective tree NYMPHS who are bound to their own specific tree and look after it. This doesn't mean they have to remain rooted to the spot and grow bark; they do get to frolic in the forest. Most DRYADS are very shy - and terribly nervous of straying too far from the safety of their tree. But when ARTEMIS comes along, they abandon all fears and join her hunting expeditions. 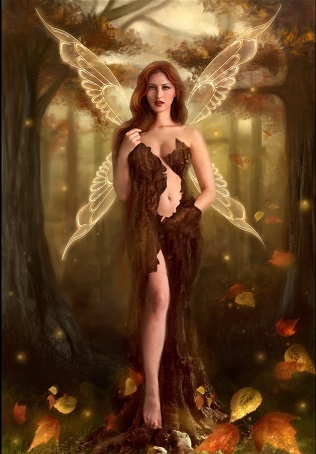 There are many kinds of DRYADS, each associated with a different species of tree. They include the DAPHNAIE (Laurel Trees), the HAMADRYADS (Oak Trees), the MELIADS (Ash and Fruit Trees) and the OREADS (Mountain Pine Trees).